Key requirements of an effective pricing solution for a mass retailer. Is MS Excel a suitable platform on which to build an effective pricing tool? The management of prices within the pricing strategy, and the resulting piloting of revenue and margin performance to ensure that financial targets are being reached, is a critical function for any retailer. The design and functional capabilities of pricing and revenue management tools need to meet the requirements of performance, efficiency, reliability and scalability expected from an effective system. a) A reliable, detailed estimation of future sales, revenues and profits per product and selling points across each sales period of a rolling forecast horizon (typically 12 to 24 weeks). b) Sales, revenues and profits forecasts to be updated after each sales period taking into account the current and future prices, costs and competitor price checks, planned promotions and ad campaigns as well as product assortments changes. c) Tracking of the forecasts reliability through a quantitative measure of its accuracy for each pricing period. d) Ability to monitor the advancement towards achieving the company financial targets by analysing after each sales period the variance between on one hand the achieved sales together with the updated forecasts for the remaining periods between now and the end of the reporting period (forecast horizon), and on the other the targets / budgets to attain, as illustrated in the graph below. Pricing tools which are not built around these analytical engines, cannot successfully meet the demands of a retailer to proactively manage its revenue and profits. An effective pricing solution should not have any “hard coded” hierarchies’ limits (e.g. a product hierarchy using a fixed three levels hierarchy [department, category, subcategory]), which will severely restrict the pricing analysts’ abilities to evaluate multiple pricing scenarios along the different business dimensions and/or levels. a) Rule Based Pricing (RBP): Adjust the prices, in order to comply only with the pricing rules defined at the product level, using implicative logic (e.g. if, then, else rules), not taking into account rules defined for groups of products and particularly financial performance rules. b) Price Optimisation: Compute the optimum price changes which maximise a selected financial indicator (e.g. % margin rate), subject to all price positioning rules, without limiting the number of price changes. The crippling deficiency of most RBP engines is that the implicative logic used to sequentially check and adjust prices one at a time, considering solely price positioning rules by order of priority, cannot deal with either group of products or sales related rules to be applied over the forecast horizon. Also, the rules relaxation logic used to resolve conflicts between some of the rules, is arbitrary and does not ensure that the necessary relaxations are minimised. Price analysts have to run RBP many times and in between each sequence to “visually” check a posteriori, if the sales or revenues rules are met. Even if only price positioning rules are applied and the number of products is small, it is very difficult to calculate prices that satisfy all rules, when not only rules limiting individual prices but also price parity rules are involved. Clearly, such an approach is inaccurate, ineffective and leads to unreliable price recommendations. The Price Optimisation quandary is that such methods do not take into account that not only it is required to achieve the company’s financial targets over the forecast horizon, but it is also required to do so with the minimum possible price changes. Price Optimisation always suggests a very large number of price adjustments, which will deliver the highest performance. However, when managing prices and piloting revenues, one does not want to change unnecessary too many prices too often. In terms of performance, the objective is to meet the company’s financial targets, not to systematically “hunt” for the highest revenue and/or profit after each sales period, running the risk of quickly destabilizing the market and the customers. We have found that what retailers are actually most interested in, within the framework of their pricing strategy, pricing image and positioning in the market and against competitor networks, is to optimise the tactical pricing rules and price accordingly, to exploit any opportunities arising as the market evolves overtime. Price image and price positioning rules are set by the marketing team on the basis of information and processes that are qualitative as well as quantitative. This implies that the rules can be used as guidelines, and then within those guidelines best adjustments may be sought for specific products or groups of products. For instance, the marketing team may decide that the retailer’s own brand should be priced between 20% and 30% cheaper than the leading national brand. However, should those exact limits be applied to all products? And if slightly varying limits are applied for different products, then what should they be and why? Is 31% or 29% better than 30% and why? The answer to this type of questions is given by rules optimisation. Rules optimisation considers the entire set of rules, their priorities and conflicts at the level of the individual products and product groups, and identifies the smallest rules adjustments, which will generate the best performance gain over the forecast horizon. Price Defender™ is the only pricing application available today, which enables the price analysts to compute the minimum price changes, which satisfy both all price positioning and financial targets, and identify and quantify additional performance gain by optimising the rules and targets. The information managed by a pricing tool is very diverse and large. Pricing analysts need to be able to generate smart dynamic reports, whose layout and content will best take into account the specifics of the company’s organisation, allowing them or other beneficiaries to interactively navigate through the different dimensions and levels peculiar to the business operations. Therefore, all the information administered by the pricing tool, including all price scenarios and recommendations have to be automatically accessible from and editable by an authentic multi-user, client-server designed BI tool, which not only scales in order to cope with the large quantity of data, but also provides all the necessary versioning, confidentiality and communication capabilities much beyond the simple transmission of Excel sheets as an email attachment. Retail is a very dynamic business involving high volumes of price-rules combinations. A price and revenue management solution needs not only to be smart by offering accurate demand forecasting models and price calculation engines, but also to be able to scale up to cope with very large number of price variables and multiple sources of information, as well as to maintain satisfactory response and calculation time. Requirements for high scalability, cost effectiveness and fast performance cannot be an “after-thought”, these features need to be at the heart of the principles, which shape the architectural design of the application. Processing and calculation times need to be evaluated from different problem sizes (load testing). 4. Is MS Excel the right platform on which to implement an effective pricing tool? Today, many retailers still use MS Excel as their main tool to manage prices and pilot revenue. In light of the requirements outlined in this discussion, can we consider that MS Excel provides a suitable platform? Clearly the answer is no. 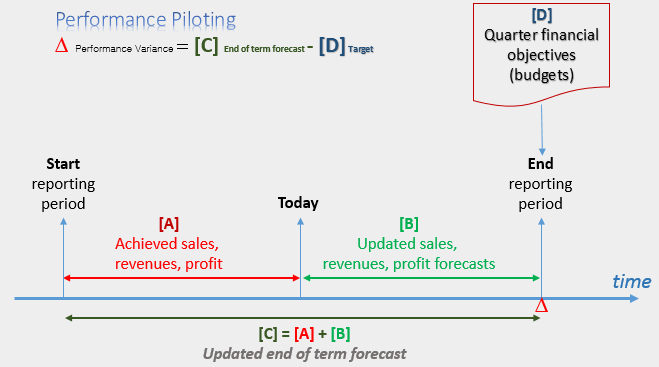 From a functional aspect, MS Excel does not provide the modelling capabilities to manage numerous, various, interdependent rules or build reliable retail demand models from which sales forecasts can be calculated, taking into account the impact of price changes, planned promotions, calendar events, cross-effects, seasonal demand variations, onto the sales, revenues and profits of each product, across the chosen forecast horizon. MS Excel’s lack of solid modelling capabilities, forces developers (price analysts themselves) to “cut-corners” and use crude alternatives (e.g. using last year sales as a surrogate for forecasted sales, applying simplistic “if-then-else” rules to adjust prices, not combining price positioning rules and performance targets to be validated across the forecast horizon, etc.). These inaccurate approximations lead to unreliable recommendations. It has to be remembered that Price Analysts are no software developers, or modelling experts. They should not spend a large proportion of their time, maintaining cumbersome and error prone sheets, ensuring that after every product assortment change, competitor price update or suppliers costs increase, the many cells of each of the sheets they use are all correct. Their job is to evaluate and analyse, with the view of spotting opportunities within the framework of the current pricing rules, or even of identifying needs to change some of those rules. For that, they need easily accessible and already processed information at their fingertips. MS Excel is typically the tool used by default not by design, by analysts who have been asked to study the sales performance and monitor price moves without being given a “proper” tool to do the job. The absence of documented business pricing process, supported by well-defined requirements is a tell-tale sign of an underperforming process and tool. The effectiveness of the spreadsheets supporting pricing and revenue management depends on the MS Excel development skills of the pricing analysts. The logic of the programmed spreadsheets and their effectiveness in making reliable recommendations are not reviewed and regularly monitored either by the retailer’s Head of Information Systems or the senior managers responsible for achieving the company’s financial targets. When pricing analysts move on to work for another company, their Excel “expertise” at developing the retailer’s pricing tool go with them. On the contrary, other knowledge workers such as management accountants, production engineers, supply and warehouse management teams are relying on purpose built, well designed systems to assist them in performing their tasks successfully. They are not being asked to manage their operations solely on spreadsheets they have developed on the fly. Excel does not scale; it is not a multi-user, client/server business application. Individual instances are installed on the analysts’ computers. The more the prices, zones, banners, categories to manage, the more and bigger the spreadsheets, the higher the maintenance, the slower the loading and computing time, and the more, and more inevitable, the errors. Updating programs or safeguard procedure cannot be run in the background. If you use MS Excel as your pricing tool, we recommend first that as an organisation, you question why. a) Is it a choice based on well-defined and documented requirements, which have been validated by senior management, IS leadership, and pricing team, or is it just because it happened that way, by default? b) Do you regularly benchmark the performance of the MS Excel, home grown tool, with purpose built solutions? c) Are the benchmark’s recommendations regarding MS Excel, and the consequences clearly explained to senior management? Airline companies manage their complex price offers and revenues using sophisticated yield management solutions. The well documented difficulties endured today by some of the major retailers (TESCO, Morrisons, Carrefour, Group Casino, Safeway US, etc. ), are clear indications that management practices are changing. Regarding pricing and revenue management, demand driven systems designed at supporting proactive decisions are being implemented by successful technology driven operators. Do you think that Amazon or eBay are managing their prices and revenues on some MS Excel spreadsheets? Validating price positioning and performance rules. Clearly, many of the price positioning and financial rules are dependent upon each other. For instance, the minimum total revenue or profit rule to be achieved for a group of products, depends on the price changes to be allowed by the price bounds, spreads and parity rules applicable to products’ prices of the group. How can one check that all price positioning and financial rules are compatible with each other? To solve this problem one first have to build and maintain overtime a retail specific causal demand forecast model, which quantifies the relationship between prices and sales, and in particular to predict how many sales units are to be sold taking into account the prices of the products, together with associated sales cross-effects and potential promotions taking place over the forecast horizon. Specifically, the demand model form needs estimate the direct and cross price/sales elasticity coefficients. Obviously, forecasting methods such as simply using the past sales data as a surrogate for a calculated sales forecasts, or exponential smoothing based methods such as Holt Winter cannot be used as they do not calibrate the sales / prices relationship. The validation of the price positioning and performance rules can be ascertained by implementing an optimisation method, which uses causal demand models, determines if the price positioning and performance rules are compatible with each other, and whether prices can be calculated, which satisfy both types of constraints (rules). The additional benefit of using an optimisation engine to validate the rules, is that conflicts between incompatible rules are resolved by computing the necessary minimum rules’ bounds values adjustments for the products where the incompatibilities manifest themselves. Ensuring that all price positioning and performance rules are compatible with each other is a compulsory prerequisite of a pricing solution for evaluating prices and managing performance. After the "price optimisation" hype of 10 years ago, one can only see that most retailers have not invested in any of the price solutions proposed by the different software vendors, although their operations became significantly more complex and their respective markets much more competitive. 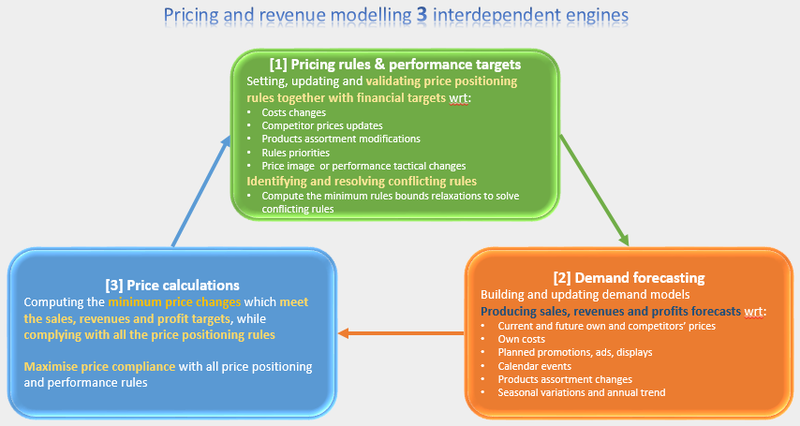 Contrary to companies operating in other mass market and service based sectors such as air transport, hotels, retail banking or telecom, our experience shows that only few retail companies have developed and implemented integrated pricing and revenue management processes and dedicated tools aimed at best piloting their performance and achieving their goals. To illustrate this paradox, let’s compare the typical pricing and revenue management processes and tools of a mainstream airline company with the ones from a grocery retailer. Both businesses operate in highly competitive and low margin mass markets. The ranges of products or services they offer are very large and the corresponding number of price variables can reach several 100,000s. Many prices changes occur regularly (dynamic pricing) to particularly take into account costs fluctuations, competitor prices variations, or changes in the products’ assortment. In addition, retailers and airlines do rely on frequent promotions to boost the demand. In the last 30 years, airline companies put in place specific and integrated pricing and revenue management procedures supported by purposely built decision support systems (yield management), aimed at forecasting future sales with respect to the current and future prices and ultimately assisting them in piloting their financial performance. It is interesting to recall that yield/revenue management methods and tools were implemented by airline companies in the mid 80’s following the deregulation of air transport in the late 70’s and the subsequent increase in competitive pressure and the ultimate arrival of low-cost new operators. The early attempts in the 80’s of some historical carriers to “price-out” (aggressive blanket price reductions) some of their competitors failed. The airline companies, which did not adapt their pricing strategy and practices to the market transformations and did not implement revenue management methods, either merged or simply went out of business. Today, pricing and yield/revenue management expertise are certainly recognised as a core asset with which airline companies can successfully pilot their performance. Pricing, promotions planning and revenue management processes are not documented and evaluated. KPI’s or benchmarking scores (e.g. sales forecast accuracy, price compliance rates, success rate to achieve targets, etc.) are not regularly calculated to assess the efficiency of the procedures and tools used as well as the quality of the decisions made. Often senior managers do not take full ownership of the approach, methods, tools, business rules and procedures making up the pricing and revenues management process, whose performance and reliability is not measured and monitored. The pricing function is seen more as an administrative/reporting function than a key lever to pilot performance. A pricing process solely focused at evaluating past performance and only reacting to either competitor prices or costs changes for justifying the retailer’s own price moves. The inability of anticipating future demand variations characterising “Reactive Pricing” leads to making underperforming and/or overreacting price changes decisions. Price decisions should be based not only on analysing past performance but also on estimating future revenue and margin calculated from reliable sales forecasts. This can be described as “Proactive Pricing”. The management team is inherently handicapped by having to play the pricing “game” with a systematic and debilitating delayed price move. Margin rates and profits are only piloted by applying for each product a given margin coefficient to the cost (cost plus). Such a simple approach cannot evaluate the profits variations from either a unit margin change (e.g. price increase) and/or a sales volume increase or decrease, and it cannot optimise the trade-off between high volume/low margin and low volume/high margin products. No implementation of a retail specific demand forecasting tool, taking into account the impact of price and costs changes, promotions, cross-effects, calendar events, seasonal variations over the forecast horizon. Still today, a majority of retailers use last year 12 months sales as a poor surrogate for estimating their future sales volumes, although the products assortment, competitive environment, own and competitor prices, etc. were very much different between then and now. MS Excel seems to be the sole pricing tool for many retailers. Many sheets are developed by the pricing team, without much validation of the approach and pricing methods used. The limitations of MS Excel are well documented. To mention just a few: It does not support the implementation of a reliable sales forecasting system or advanced price calculation engine (e.g. RBP) ensuring compliance with both price positioning and financial rules; it does not scale to high volumes of data; it is not multi-user; as the maintenance of numerous sheets requires of lot of manual and repetitive work, it is error prone and time ineffective. Revenues and margin projections are not systematically and regularly (e.g. weekly) updated, taking into account the impact of price changes, together with planned promotions or changes in the products assortment over the forecast horizon. 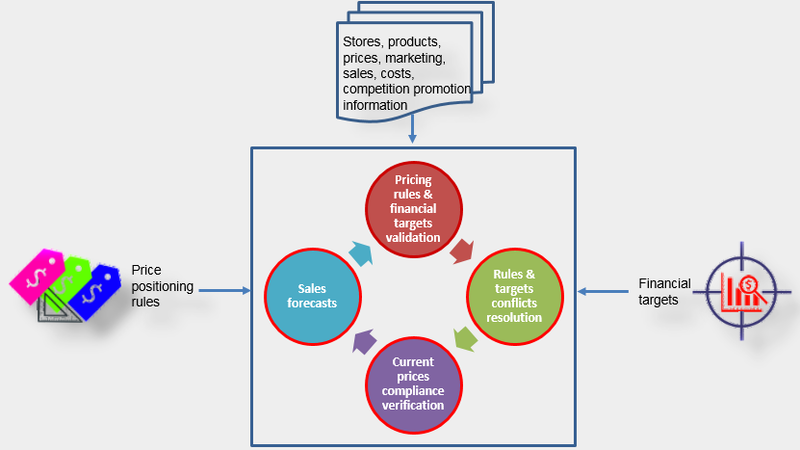 The lack of reliable retail focused sales forecasts, which formalise the relationship between sales volumes, prices and costs, revenues and profits, prevents the pricing team to proactively validate the coherence between the price positioning rules (pricing strategy) and the financial targets over the forecast horizon. In April 2014, Mr Dalton Philips, Morrisons' boss, likens the shift in the UK grocery market to the changes seen in the airline industry, when new disruptive players - the budget airlines - came on the scene. “The lesson is that once you see this disruption and fragmentation, the clock is not going to be turned back…. And those who felt this was a passing fad or part of the economic cycle and failed to adapt, paid a heavy price." However, although a change of the pricing strategy was required, these considerable and somewhat indiscriminate price cuts, had the prejudicial effect of triggering severe price wars, dragging the whole market down, with no benefits gained. A typical example of knee-jerked “reactive pricing”. Today, the business situation of the UK major retailers do seem to have improved, as illustrated in the Telegraph article referenced below. As it happened for the airline industry 30 years ago, retailers will have to develop and implement pricing and revenue management methods, processes and tools, which will give them the ability to pilot their performance, within a much more global and competitive market.